Here's one traveller who had no trouble offloading his campervan at the end of his New Zealand tour. Adam, from the UK, ended up on nationwide breakfast TV! Below is a series of three Youtube videos from TVNZ's Breakfast show as reporter Tamati Coffey investigates a campervan parked on Auckland's Queen St. As the story unfolds, they find a for sale sign, ring Adam the owner and lure him back to the campervan -- called "Dub-dub" -- where he demonstrates how everything works. The foldaway stove behind the passenger seat is a little alarming and the bed takes a while to fold down, but that's life in a Kombi for you. If you're looking for campervan hire in New Zealand check out http://campervanhirenz.co.nz. You'll find all shapes and sizes of campervan so you can enjoy your trip in comfort. Adam says some pretty memorable things in the clips. When asked if he is single, he says "This is my girlfriend right now", referring to "Dub-dub". And when asked if he's leaving New Zealand with an enduring memory, he says "Driving around in my Kombi I feel like I'm driving around in a photograph." Nice. 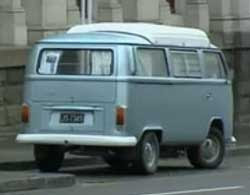 For a great deal on campervan hire in New Zealand check out http://campervanhirenz.co.nz.